The Ffestiniog Railway (Welsh: Rheilffordd Ffestiniog) is a 1 ft 11 1⁄2 in (597 mm) narrow-gauge heritage railway, located in Gwynedd, Wales. It is a major tourist attraction located mainly within the Snowdonia National Park. The railway is roughly 13 1⁄2 miles (21.7 km) long and runs from the harbour at Porthmadog to the slate mining town of Blaenau Ffestiniog, travelling through forested and mountainous scenery. The line is single track throughout with four intermediate passing places. The first mile of the line out of Porthmadog runs atop an embankment locally called the Cob, which is the dyke of the Traeth Mawr "polder". The Festiniog Railway Company which owns the railway is the oldest surviving railway company in the world. It also owns the Welsh Highland Railway which was re-opened fully in 2011. The two railways share the same track gauge and meet at Porthmadog station, with some trains working the entire 40 mile route from Blaenau Ffestiniog to Caernarfon. 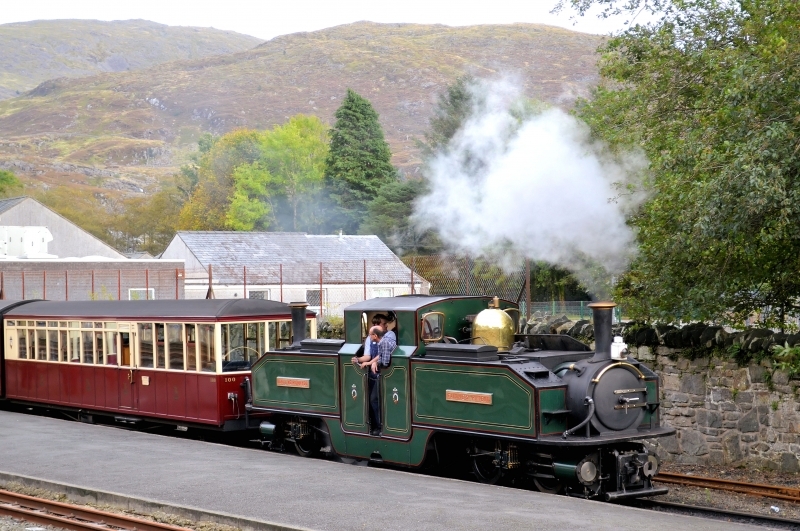 Please give us your overall rating for Ffestiniog Railway.